Chef’s Tip: Leeks have many layers and are grown in sandy soil, so they need to be cleaned well. Cut off the dark green tops and about ½” from the root end. Chop the leeks as required for your recipe and place them in a bowl of water. Swish them around a bit and let them sit for five minutes. Grit and sand will fall to the bottom, and you can gently scoop your cleaned leeks from the top. The cleaned green tops are great for making homemade broths! Heat oil or ghee in a stock pot over medium-low heat. Sauté garlic and leeks until soft and translucent, about 4 minutes. Add asparagus, stock, lemon juice, salt, and pepper. 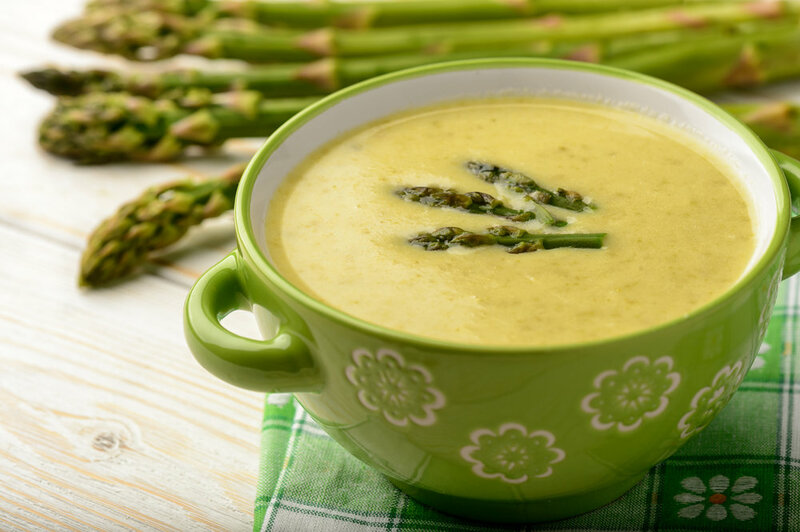 Simmer for 15-20 minutes, or until asparagus is tender. Add half of the tarragon. Use an immersion hand blender, or let cool slightly and transfer (in batches if needed) to a blender. Blend until smooth. Let cool completely. Store 4 servings in separate containers in the fridge, for lunch Days 1 and 3, and 2 servings in separate containers in the freezer for lunch on Day 7. To serve, garnish with yogurt and tarragon.